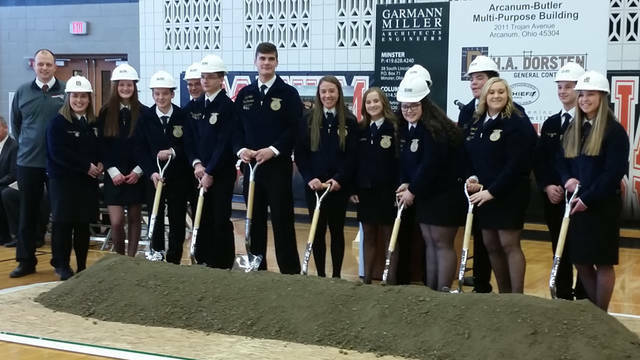 Arcanum Butler FFA members took an opportunity to shovel dirt from their new Ag Education building’s construction site during a groundbreaking ceremony held Friday inside their high school gymnasium. 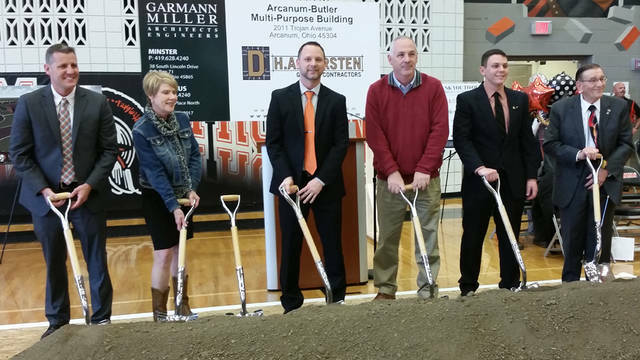 Several groups were invited to shovel dirt brought into the Arcanum High School gym during groundbreaking ceremonies held Friday for the district’s new Ag Education/Multipurpose building. Pictured are Arcanum Mayor Greg Baumle, Director of Ohio Agriculture Dorothy Pelanda, Superintendent John Stephens, State Sen. Stephen Huffman, Arcanum grad and former FFA President Alex Weiss and former State Rep. Jim Buchy. Special guests who were invited to share a few thoughts included Arcanum grad and former FFA President Alex Weiss, State Rep. Jena Powell, State Sen. Stephen Huffman, Director of Ohio Department of Agriculture Dorothy Pelanda and former State Rep. Jim Buchy. Growing up near Arcanum on a 2,000-acre family farm, Powell said, generated “some of my greatest memories,” which included driving semis and tractors and showing sheep at the Great Darke County Fair. Powell urged the students to “take advantage” of their new ag ed building. Buchy said he thought it was appropriate the groundbreaking ceremony was being held on the Ides of March, giving the crowd a little history lesson. March 15 – Ides of March – was the day the Romans had set for settling their debts, Buchy explained, noting how the support from community and business partners had made it possible for the new building to be paid for when students walk in the first day. “You are building a facility to continue the growth of the No. 1 business in the county,” Buchy said of the county’s rich agriculture history. The district is working with Garmann Miller Architects to construct the facility, which will feature FFA classrooms, lab and greenhouse. There’s also space for additional storage and athletic facilities, including a weight room. A community room also is planned. Stephans took time to thank the district’s business partners/donors, including Ralph and Phyllis Brumbaugh, Cargill, Jason Brewer, Jason Clemons, Lorey Collins, Lisa Norris, Somer Osswald, Hannah Stikeleather, Tom Taylor, Josh Witter, Edison State Community College, Chad Beanblossom, Rachel Carlisle, Rick Hanes, Dr. Doreen Larson, Bruce McKenzie, John Shishoff, Greenville Federal Bank, Jeff Kniese, Greenville National Bank, Amy Huber, JAFE Decorating, Katie Smith Contracting, Miami Valley Career Technology Center (lab), Dr. Nick Weldy, Phil and Karen Garbig, Premier Health, Shad Bernard, Mary Garman, Teresa Leeper, Mallon Pittman, MVH North Sports Medicine, Second National Bank, Jerry Beatty, The Andersons and Ted Hafer. This entry was tagged Arcanum, Arcanum-Butler Schools, groundbreaking, Multipurpose Agriculture and Athletic Building. Bookmark the permalink.